Our Guest Services team is ready to help with any questions you may have about the services and amenities at H-E-B Center. Please feel free to visit the Guest Services Desk behind Section 121 for all of your needs. To reach the Guest Services department ON EVENT DAY, please contact 512-600-5154 or email inquiries to [email protected]. For guest services requests PRIOR to event day, contact [email protected] or call 512-600-5000 during normal business hours. 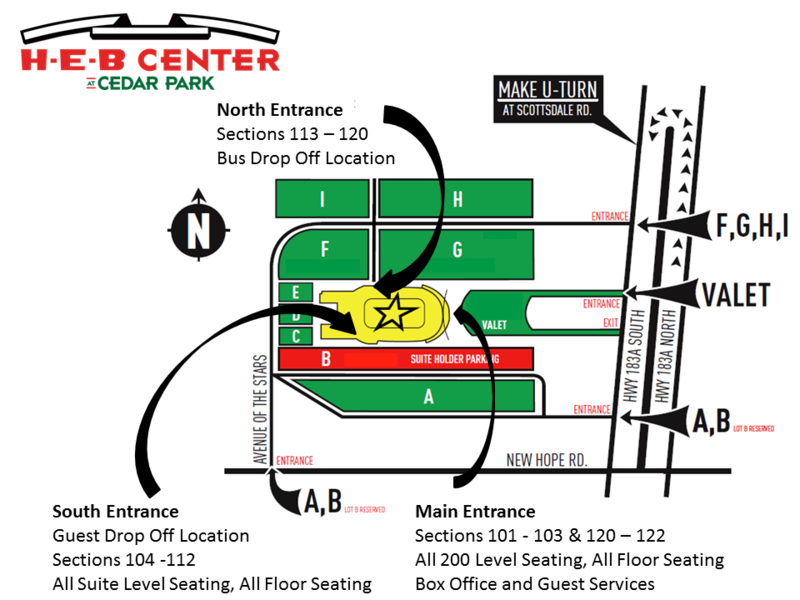 H-E-B Center at Cedar Park has accessible/disabled seating options on both levels of the venue. This seating can be purchased online at www.ticketmaster.com, over the phone by calling (512)600-5001 or by visiting the venue’s box office. Assisted Listening Devices (ALD) may be checked out, free of charge, on a first come, first served basis, at the Guest Services Desk located behind Section 121. A valid I.D. is required to ensure the return of equipment. An AED is a device used to administer an electric shock through the chest wall of the heart. A built in computer assesses the patient's heart rhythm, judges whether defibrillation is needed and then administers the shock. Audible and / or visual prompts guide the user through the process. An AED machine is located on the main concourse at the Guest Services Desk behind Section 121, in First Aid behind Section 109, and on the suite level in the northwest and southeast corners. These portable models allow non-medical personnel to respond to a medical emergency where defibrillation is required. For your convenience, H-E-B Center has two (2) Plain's Capital Bank ATMs located on the main concourse behind Section 122 and 102. There are also two (2) UFCU ATMs located behind sections 116 and 108. Baby changing stations are located throughout the venue in various men's, women's and all family restrooms. A limited number of child booster seats are available at guest services (located by section 121) on a first-come, first-served basis. A valid ID is required to ensure the return of equipment. H-E-B Center at Cedar Park features three (3) elevators. One is located at the South Plaza entry vestibule, one at North Plaza entry vestibule, and another in the Southeast corner of the main concourse behind Section 103. All three elevators have service to the At Home suite & loge level of the facility. H-E-B Center personnel have been trained in proper emergency preparedness. Please follow the direction of Security or Guest Services personnel in the event of an emergency. In the event of an emergency where evacuation of the building is necessary, you will be informed via public address announcement and scoreboard message to do so. Please remain calm and walk towards the nearest exit. Follow posted signs, staff instructions, and listen for announcements for specific information. If you become separated from your party, the general meeting area for patrons is the north berm farthest from the building. In the instance of severe weather or other outside threats, you will be directed via public address announcement to remain inside the building and staff will direct you where it is safe to seek shelter. For your safety, H-E-B Center has professionally trained emergency personnel on site for all events. The First Aid station is located outside Section 109 on the main level, inside the South entrance foyer. In the event of an emergency, please go to the first available H-E-B Center representative for assistance. Patrons requesting interpreting services for events should contact [email protected] no later than 72 hours prior to an event. During an event, lost and found is located at the Guest Services desk behind Section 121. If you think you lost an item during an event, inquiries can be made by calling 512-600-5000 the following business day. Messages left at this extension will be returned by a member of the H-E-B Center team. Lost children should be escorted to the nearest H-E-B Center team member. In the event that you become separated from your child or a member of your party, you will also want to contact the nearest team member for assistance. H-E-B Center offers ample men's, women's, and family restrooms on both levels of the facility, all of which are accessible to persons with disabilities. Baby changing stations are located in most men's and women's restrooms and all family restrooms. Animals are not permitted for entry into H-E-B Center. Accommodations will be made for patrons requiring the assistance of a trained and harnessed service animal and during promotional nights. Please contact our Guest Services Department if any accommodations are required by emailing us at [email protected] or [email protected] (event day only). There are several designated areas at H-E-B Center for smoking that include: the outside patio of the Bud Light Lounge (next to the East main entrance doors), outside of the North and South Plaza entrance doors on the main level, and on the balconies in the northwest and southwest corners of the suite level. The use of E-cigarettes and any smoking paraphernalia is prohibited inside H-E-B Center. Strollers are not permitted inside the seating area at any time. If necessary, strollers may be checked in at the Guest Services Desk behind Section 121 upon entering the facility. H-E-B Center is not responsible for any lost, stolen, or damaged strollers. Taxi and car service drop-off and pick-up locations are limited to the South Entrance doors and can be accessed via New Hope Road and the B parking lot. Limos must drop off and pick up at the North Entrance Doors and can be accessed via New Hope Road and parking lots F/G. A telephone is available at no charge at the Guest Services Desk behind Section 121 on the main concourse. H-E-B Center offers wheelchair service for guests who may need assistance to and from entrances and/or seats. Please contact a Guest Services representative for assistance. Wheelchair assistance is provided on a first-come, first-served basis. Due to the limited number of wheelchairs available, they may not be borrowed or rented as seating during an event. If wheelchair assistance is necessary during an event, please notify the nearest staff member. For guests who wish to transfer to a seat from their wheelchair, H-E-B Center will store your wheelchair at Guest Services. Our staff will make arrangements at time of retrieval to return the wheelchair to you at the end of the event, or any other preferable time. No password/passcode is required to connect. Users will be automatically redirected to a browser where existing Spectrum customers can sign in to use the service, or users can choose “Guest” and get one hour of FREE Internet access with the option to purchase additional time.